Are you looking for your nearest physio led Pilates classes Keperra? 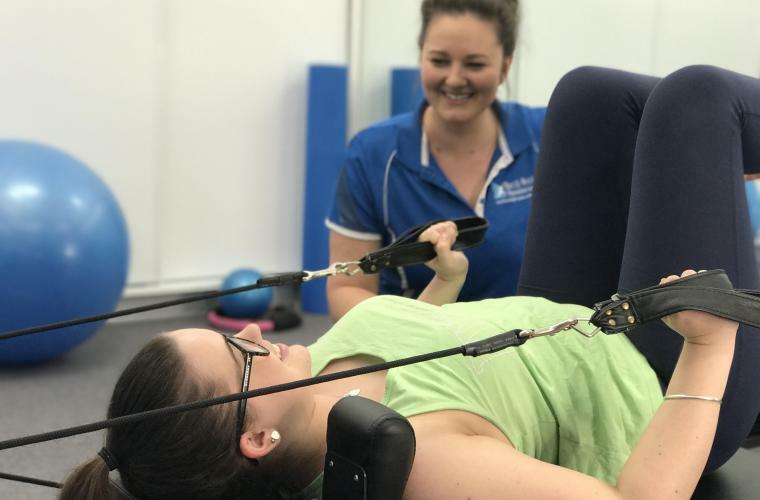 North West Physiotherapy is proud to offer functional core strength classes featuring evidence-based Pilates exercises throughout the week at our clinic. Our classes, with a maximum of 3 participants, are tailored to suit any age, mobility and fitness level, plus we also cater for both pregnant and post-natal patients as well. And the good news is private health rebates will still apply after 1 April 2019 as our classes are led by a qualified physio and tailored to your exact health needs. To find out more or to book your spot, phone us on 07 3198 4444 or drop in and meet our team at the Great Western Super Centre Shop F14B, corner Samford and Settlement Roads, Keperra. What can I expect in a functional core strength class? Our low impact functional core strength classes incorporate evidence-based Pilates exercises. Each session runs for almost an hour where participants undertake a series of tailored and closely supervised exercises with a focus on improving functional strength and flexibility in a comfortable environment. This type of exercise is ideal for rehabilitating after injuries and surgeries and preventing further issues in the future. What’s type of equipment is used? We have a range of equipment including a reformer, a Pilates chair, Pilates rings, gym balls, weights and TheraBand’s to provide a wide variety of resistance and flexibility exercises depending on the needs of each client. We run our classes in a circuit type format, so each participant is doing their own prescribed exercises rather than just following a pre-set routine. Participants can also expect a relaxed, friendly, supportive and non-competitive environment when they attend Pilates classes at Keperra. Improved body position awareness and co-ordination. Quicker return to normal daily activities after an injury or surgery. Prevention/reduction of future issues and injuries. Why choose North West Physio? We believe that our small circuit style classes provide the best outcomes for patients as they allow the physio to provide very close supervision and correct poor technique immediately. With changes to private health rebates in April 2019, you’ll still be able to enjoy participating in Pilates inspired classes and claim your health fund rebate as our functional core strength classes are tailored to your health concerns and goals, and led by our qualified physios. This enables us to prescribe each participant exactly the exercises they need with the correct technique at just the right resistance level, helping to minimise further injuries and ensure that each class is as efficient and effective as possible. When are Pilates classes held at North West Physio Keperra? We have multiple sessions, run by our physios, available during the week. Click here to view the current timetable. Please call us on 07 3198 4444 to join one of our classes. Come along and see what Pilates is all about by joining one of our classes. Call our office on 07 3198 4444 or visit us at the Great Western Super Centre Shop F14B, corner Samford and Settlement Roads, Keperra.